Former Canisius guard Harold Washington says he has signed a professional contract to play with the club CSM Constantine in Algeria. CSM Constantine appears to have beaten GS Petroleum in a three-game series for the Algeria Super Division title in May, but lost to them later that month for the Algerian Cup. Fourteen consecutive scoreless innings are usually enough from a JV pitching staff to get the team on a roll. Usually. But this game was not like any other game, not at all. Canisius High School’s JV Gold team — the school’s ‘B’ team, if you will — lost by a final of 3-1. The boys, all freshmen, allowed one run in the top of the first inning, played four and a half hours of shutout defense, and then let in two more in the top of the 16th. The opponent? Canisius High School JV Blue, the ‘A’ team. Normally, you might think an ‘A’ team would have its way with the ‘B.’ Blue gets first dibs after the varsity and is composed of all sophomores, save the school’s top four freshmen ballplayers. But the combination of wood bats and a large strike zone with the emotional wave of I’ll-show-you-for-cutting-me from the Gold was enough level the playing field. Even the coach's wife had to leave at some point, and when she did, she pawned the book off on the closest spectator -- me. The coach doesn't use the stats section, and after 12 innings, we had to get creative. Gold’s closer worked a scoreless seventh, and eighth, and ninth, before being replaced midway through the 10th. When Blue broke through with the occasional single or walk, Gold’s catcher took the momentum right back, shooting down what seemed like half a dozen runners trying to steal second. It was Gold, the ‘B’ team, that threatened first in extras. A 60-foot swinging bunt down the high grass on Delaware 1’s third base line loaded the bases with one out. Blue coach Tom Coppola nervously arranged his defense. He brought the infield in and moved the left and center fielders up to have a shot throwing out the winning run and the plate. He made a gambit with his right fielder, having him stand over second base to cut off a single up the middle, giving up anything the right-handed batter might drop over the right side of the infield. Five infielders got ready for the pitch, which was scorched right at Blue’s first baseman. The runner wasn’t being held on with the infield in, and even if he had frozen on the line drive, he didn’t stand a chance. Double play. Gold’s first baseman wanted his shot to be the hero a few innings later. He wouldn’t get the chance. The 14-year-old came late to the game right from a wedding. By the time the 14th inning rolled around, his dad was back to pick him up for the reception, and it couldn’t wait… meaning the wife was not happy. He was due up fourth in the bottom of the inning, but it wouldn’t have mattered anyway — Gold went down 1-2-3. In the 15th inning, Coppola remarked to Ray Bielanin, the Gold coach, that it was going to take two consecutive hits to win the game. Timely hitting was hard to come by, and both sides had played remarkably clean defense throughout (although it’s a good thing baserunning blunders don’t count as errors). In the “visitor’s” half of the 16th, the Gold defense at last showed a glimpse of whatever margin it is that separates it from the ‘A’ team. A leadoff single and a walk put the go-ahead run in scoring position with nobody out and a sac bunt moved the runners over. Bielanin, who had 13 appearances as a relief pitcher in advanced rookie ball in 1989, came over for a look at the score book. 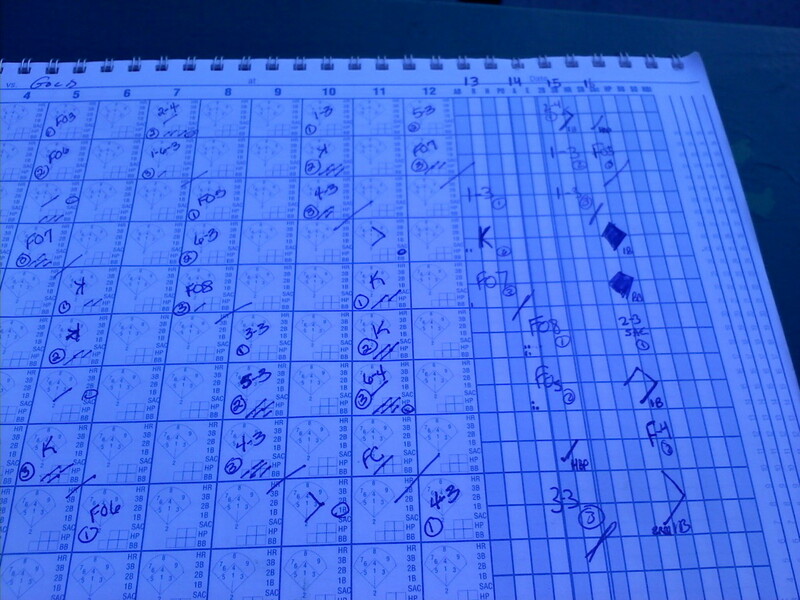 The batter was Blue’s 7-hitter, who was 1-for-5 on the day and hadn’t been on base in 10 innings. Instead of walking him to set up a force play at the plate, or a potential inning-ending double play, or both, Bielanin decided to pitch to him. An underdog can’t always settle for conventional wisdom. Gold got the result it was looking for, just not the execution. The ball was popped up behind the shortstop, who was playing slightly up. Bielanin’s reaction led you to believe he thought the ball was catachable; it landed on the lip of the outfield grass. The runners stayed put and the bases were loaded. It was like an intentional walk, just without the out. But that out was one Gold couldn’t give away. The 8-hitter popped up to second which should have been the third out. Instead, it was an infield fly for the second out, and 9-hitter, of all people, made it hurt. A sharply hit grounder up the middle just got past a diving second baseman, scoring two runs Gold knew it wouldn’t get back. There was hope when Blue’s center fielder made an error trying turn a shoestring catch into a flashy dive in the bottom of the 16th, but Blue, which rode a freshman pitcher for approximately innings 10 through 16, finally showed some reason for it to be the ‘A’ team, outlasting Gold by the slimmest of margins, 3-1. It was a game no one deserved to lose, even though you might have thought one, the ‘B,’ probably should have. Give credit to the umpire, who, although inconsistent, stuck around long after the seven innings he was paid for.